From left, Ethan Cairns, Coach Alisa Cairns, Zach Levine, Travis Booth, Jake Levine, Liam McCue, Jameson Roller, Anika Pitz, Destiny Thompson and Claire Kelly in Oceanside.Photo by Alisa Cairns and Lori Levine. 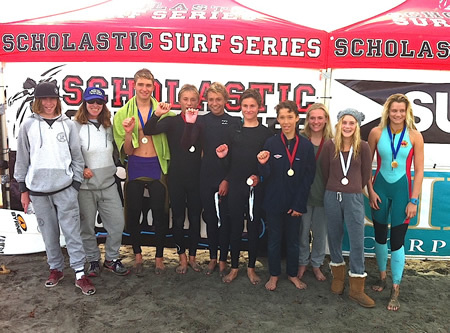 The Laguna Beach High School surf team took the overall win at South Jetty in Oceanside in the second event of the Scholastic Surf Series, according to coaches Scott Finn and Alisa Cairns. Four of the six boys in shortboard made it to the finals. Travis Booth was the champion stand out all day dominating each of his heats. Zach Levine finished in second and his brother Jake Levine took third. Liam McCue finished fourth. Jameson Roller’s fancy footwork and nose rides in the longboard competition brought in a win. In girls longboard Anika Pitz was the winner being the only girl in the final not to be swept past the jetty. Claire Kelly and Destiny Thompson in girls shortboard placed second and third for the day. In the bodyboard final Spencer Davis placed second. The next Scholastic Surf Series event will be Jan 24.